Today, the war in Afghanistan enters its tenth year with little sign of an end. Extra American troops may now be in place, but public support for the campaign is slipping rapidly, with about 2,000 NATO troops having been killed in the conflict. It is now the crucial time for the US president to reverse the fight against the Taliban until the exit of the international forces next year. Afghan officials continue to back the US-led coalition, but even they admit that in the tenth-year of the war there’s still no tangible result. And very often American soldiers lead a strange online-war, ironically helping their enemy. A house goes up in smoke. And whether justified or not, tempers fly in the Afghan capital. The culprits, soldiers who can be heard saying 'fantastic' before posting the clip on the internet. “Even if, in burning a house accidentally a copy of the Koran is burned in that house, that can be easily used as a tactic or as a means of attracting more religious students to join the Taliban and Al-Qaeda,” said Waheed Warasta, the Executive director of the Afghanistan PEN Center. And it seems to be working. More and more Islamic extremist websites are hosting direct links to videos put up on the web by the soldiers themselves. In blogs and social networking sites, it is their enemy who are now, ironically, helping the Taliban fight its own cause. “They can easily be copied by Al-Qaeda and the Taliban, they can easily make anti-US films and clips,” Warasta said. In some cases, US soldiers' videos are prankish and childish, other times they are downright criminal. Or they can be extremely provocative – there is a clip in which US soldiers burn the bodies of dead Muslims facing Mecca. Today in Afghanistan, the Internet is becoming more and more popular, though only a few people who have access to it. Said Samim's home connection is so unreliable that every afternoon he comes to an Internet café to watch videos that make him angry. “We see hundreds of videos about Afghanistan, NATO and the Americans talking about human rights, but you can see the proof online – it’s a lie,” Samim told RT. Internet cafes are the buzz in downtown Kabul. Khalid Habib has managed a small and overcrowded café for the past two years. And although the connections are slow, they are fast enough to keep people logged on. Less than a decade ago when the Taliban was in power, home computers were banned. Then, there were only three places in Kabul that had Internet. But now, the global jihadists understand that sometimes an email might just be mightier than the sword. “The Taliban send me emails, and Taliban send messages by mobile phone, and Taliban make very, very good video clips,” political analyst Waheed Mozhdah said. The word – it seems – always has a way of getting out. “Afghan people not need to see these kinds of things on the Internet, because they also see this in their real life,” Mozhdah added. With the Taliban picking up on a form of communication it once banned, it now falls on coalition troops to censor themselves. The head of Russia's anti-narcotics agency, Viktor Ivanov, says years of the US campaign in Afghanistan have stalled the fight against drugs in the country. “The nine years of the US campaign in Afghanistan shows: more fighting equals less chance to destroy the narcotics business,” Viktor Ivanov said. “Only the government capable of ruling the country, based on the population's support, can solve the drug problem,” he added. The gap between the middle class and the upper-middle class is growing day by day in Afghanistan, an unfortunate by-product of policy program that is not really aligned with the overall strategic picture, because the economy does matter a great deal in stabilizing the country, shares Candace Rondeaux, a South Asia senior analyst from Crisis Group Kabul. Brian Becker, the national co-ordinator of the ANSWER Coalition, a US pressure group, thinks that fears an American pull-out from Afghanistan will escalate violence in the region are totally unjustified. “The killing of large numbers of Afghan civilians and Pakistani civilians, just as…in Iraq, only leads to an escalation in a cycle of violence that breeds resentment. Clearly people in Afghanistan, and Iraq, and everywhere don’t want to live under foreign occupation,” he said. He was skeptical of Obama’s vow to withdraw troops from Afghanistan by 2011, calling it nothing but a way to placate the American public, who are tired of the war, which, nevertheless, is going to continue. “Right now the generals don’t want it to end, because if it ends now, it will…be perceived [as] a defeat of the US military in this country. But the thing is, this defeat is coming, because the US cannot militarily subjugate Afghanistan,” he warned. It is very difficult to say what the situation is going to be like if the foreign troops leave, says Paul Ingram, Executive Director of the British American Security Information Council, as he does not predict full withdrawal happening for another several years yet. Patricia DeGennaro, a political scientist from New York University, ruled out the possibility of the US troops’ pullout from Afghanistan. “There was basically a misunderstanding of what President Obama said. I think the understanding is that the troops that completed the surge will begin again to pullout in July, so it won’t be a full pullout of troops. But having said that, I think we are still going to be in the country for a very long time, I mean, we are hearing from the general at least five years,” she pointed out. It is high time for peaceful negotiations to begin in Afghanistan, DeGennaro said. Although it is frequently said that this war cannot be won militarily, the war has not had enough of a civilian-led complement, she explained. 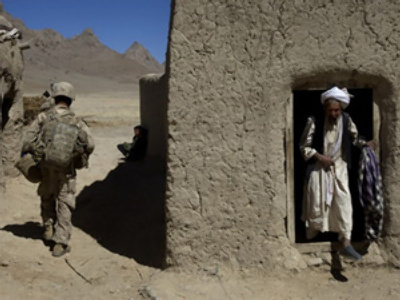 As there is no civilian replacement for the American troops in the country right now, without the negotiations Afghanistan is likely to sink back into civil war as soon as the US troops leave its territory. There are some pro-American views, though, among severe criticism of US actions in Afghanistan. Security expert James Carafano says the US will only withdraw from the country when the violence decreases.